I thought for this track season I would try and highlight each week's top performances, when I can, starting after this weekend's Kent Young Athletes League and UK Youth Development League. This league is for the under 13s and 15s, with two divisions. TAC have teams in each division, plus non scorers are allowed. The overall team score combines all four age groups ie u13 and u15 for boys and girls and in this first match we placed second to Blackheath. On Saturday Alex Howard won a 2000m steeplechase for Oxford University today in a personal best of 6.08.1, at Kingston. Early Sunday morning the Darent Valley 10k took place, with Dan Watt finish 3rd in 35.58 and Joe Watts 67th in 41.44. Provisional results are on the Results 2015 page. The day will be remembered for the cool and windy conditions, although the sun did shine throughout the seven hours of action. The wind made fast times in the distance races almost impossible, but TAC athletes still produced many wins, personal bests and debut performances. It was good to see such a good team spirit that helped towards the team victory, in this first match of the season. This was typified when it came to the steeplechases, where we witnessed a number having their first go at the distance. The biggest pbs of the day came from Stuart Brown in the 2000m steeplechase and Phoebe Barker in the 1500 metres. Below area few photos of some of the action. Michael Ellis ran a debut 400m hurdles in 66.81 to finish 4th in the Sheffield University varsity match and then followed up with a 1500m in 4.18.88, which is just three seconds away from his pb. At Wimbledon Park track, Miles Weatherseed ran 4.28.94 to finish 3rd in the Dave Clarke, Under 20 men's mile, having gone through halfway in 2.26. Joe O'Hara from Bexley won in 4.27.73, with Will Fuller, from Blackheath 2nd in 4.28.25. Race video now loaded. At the Medway and Maidstone Open Meeting Sean Molloy won the 400 metres in 50.11. Also Christian Lee ran 2.05.94 (just outside his pb) and Tom Dean ran 2.07.50 for 800m. 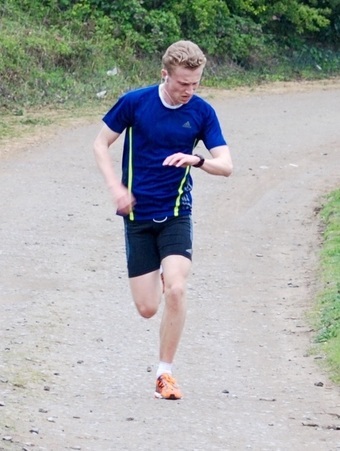 Michael Ellis, using it more as a training run, recorded 82.40 at the Sheffield Half Marathon. Dan Sims has run 2.47.54 at the Paris Marathon. 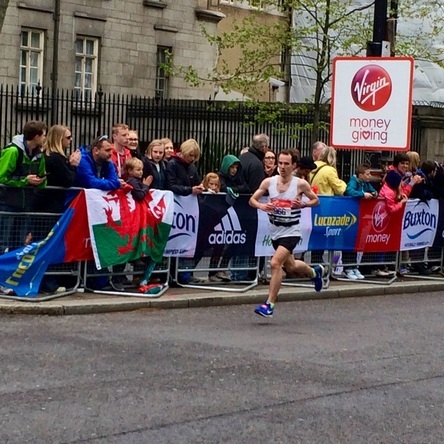 Duncan Ralph ran a personal best of 3.52.12 at the Brighton Marathon. John Harley broke his own club over 60 men's 10k road race record with a 39.58 clocking at the Ronnie Bowker Foundation event, in Birmingham. John finished 14th overall and won his age category. 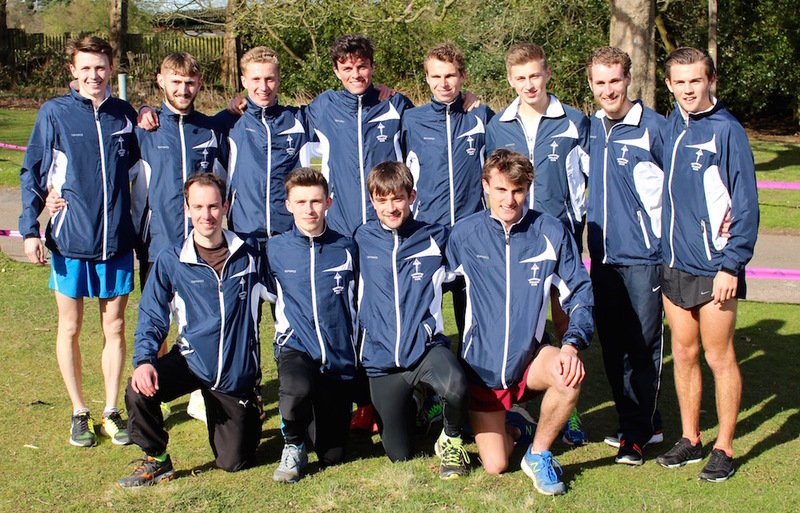 Tonbridge AC was formed in 1947 and so is 68 years old, but it was today that TAC's men's squad produced the best team performance that the club has ever witnessed. The team finished 5th of the 67 qualifying teams that started the race and so improved on the 28th, 19th, 14th and 13th of the last four years (the only occasions that TAC have qualified and finished a team). The race consisted of alternating 'Long' legs of 8.96km and 'Short' of 5.14km, although both were about a minute longer than the traditional course used since 1970 (the event commenced in 1967). Ben Cole set the team up fantastically well with a 27.31 clocking in 8th place, before George Duggan moved us up to 6th with 16.05. Ben's time was the 13th fastest of the whole race. Henry Pearce then took over, but was not at his best and slipped six places with 29.26, before Dom Brown ran a superb 15.39 to put the team back into 7th, with what was the 11th fastest short leg overall. Corey De'Ath ran 29.03 for the fifth lap and lost two places, with what was still a very solid performance, before Tom Cox took us to halfway. Tom ran a blinder with 15.45 to move the team to 7th, recording the race's 15th fastest lap. Max Nichollls ran 28.52 as we slipped back to 9th once again, a position that Dan bradley (16.22) and Ryan Driscoll (28.42) maintained. Alex Howard (16.32) dropped to 10th, but importantly had three teams within 26 seconds of him at the finish. So that was ten legs of the twelve completed and I was wondering whether a position in the top ten was as far as we could go. All the other teams around us seemed to have good depth and we just couldn't move forward, which I suppose is what should be expected, when mixing it with the top ten in the UK. However, on leg 11 things started to change as GB junior international Chris Olley ran the third fastest lap of the stage with 27.54 and moved us up three positions to 7th. Crucially we were now also on the tails of Highgate and Kent AC, with Luca Russo anchoring our squad. When I saw Luca after 1500 metres he had drawn level with the other two teams and ran an astute tactical leg to come home 5th, behind Morpeth, Notts AC, Leeds City and Central (Scotland). Just seven seconds behind us were Kent AC, with Highgate 7th. Luca had run 15.58 to bring us home as the top 'Southern' team, fourth best in England and fifth in the UK. Apart from those that raced we had a terrific amount of support from friends and families, which I believe made a real difference. It might takes us three or four more years to break into the top three, but hopefully we can do this, as half the team today competed as under 20s last Winter. Robbie Farnham-Rose continued his top form in the USA by winning in the Border Clash meet, at Starkville Mississippi, over 1500 metres. Robbie lowered his personal best to 3.44.72 and reports that he felt good, running a final lap in 57 seconds. Race video now loaded ! Kieran Reilly ran 4.03.25 for 1500m in Louisville, but i have yet to hear from Kieran. At Tonbridge 1st Stuart Brown in approximately 17.00 (not registered so showing as Unknown in the official results). 1st lady and 2nd overall Nicola Wilkinson in 18.59. There is an article about Tonbridge AC in this weeks Athletics Weekly, available in all good newsagents. A pdf that they have sent us is in the file below. See www.athleticsweekly.com for details of subscriptions. Possibly the best weather of the year so far greeted athletes and supporters at Tonbridge for the traditional early season meeting. There was plenty of action, including eleven 600m races and eighteen 150m heats. Results are on the Results 2015 page. Below are a few photos from the distance races. At Tonbridge there were 24 TAC members for the final event that contributed to the TAC parkrun Winter Grand Prix. Mark Pitcairn-Knowles has supplied the league table in the file below. There was a three way tie between James Kingston, Ollie Dunn and Andrew Mercer. After some consideration Andrew Mercer has been declared the winner having recorded the highest age grade percentage of the three, in terms of standout performance. 1st Andrew Mercer 80.37%, 2nd Ollie Dunn 78.40%, 3rd James Kingston 76.92%. Andrew will receive the trophy from Mark Pitcairn-Knowles shortly. Kieran Reilly ran 5000 metres in 14.46.72, for Indiana University, at Stanford, California. His only previous attempt at the distance was in 2009, as an under 17, when he ran 16.55.2. Milton Keynes once again hosted the South of England Road Relay Championships, where the men's race comprises of teams of twelve and the women's teams of six. The men alternate legs of 7644m and 5053m, whilst the women race over the shorter distance. In many ways these championships and the National on 11th April are the biggest test of a club's depth in distance running, which means that, despite the men's race lasting for more than four hours, the outcome is often in doubt until the end. TAC went into both races, without our strongest squads, with the men particularly hit hard by absences. It was therefore a terrific effort by those present, to ensure that both squads came away having finished higher than any Tonbridge team has done before. The men were 4th and the women 11th. What's more is the fact that both teams are relatively young, with half the men's squad having competed as under 20 this Winter and five of the six women, likewise. Belief is certainly starting to run through the veins of both our runners and supporters that the men in particular are now getting very close to being able to compete with the best in the UK over a 12 leg race. Full results on the Results 2015 page. Photos below - Men's A-team. Photos below -Women's team and Men's B team (apologies as no photo of Mark Pitcairn-Knowles). Matt Harvey ran 1.25.11 and Duncan Ralph 1.41.25. For Matt that was a personal best by 4.39 and for Duncan a pb by 9 seconds. Whilst most of you were asleep there were a couple of Tonbridge athletes competing in the USA, both opening their outdoor seasons with a 1500 metres. Race video now loaded ! Many thanks to all the TAC helpers who helped with putting on the schools inter counties today. There was a moment during one of the races which really made an impression on a few of us. TAC's Maria Bragin was struggling up the long hill, with a knee that hurt and was quite upset. 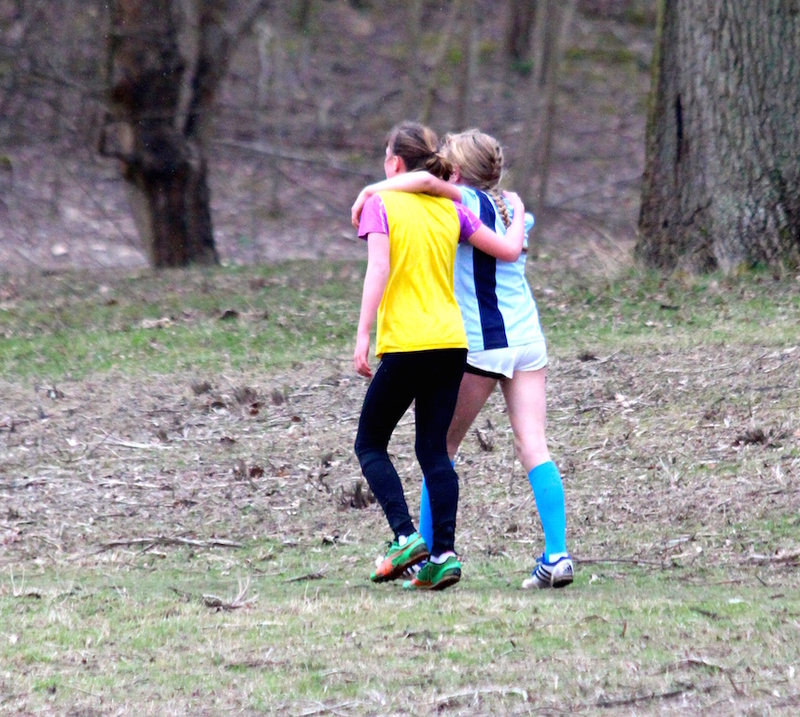 She insisted that she wanted to finish and there was another county's athlete in a similar predicament just ahead. Maria caught her up and then they helped each other to the finish line, which was probably about a kilometre away at the time. It reminded me of Derek Redmond being helped around the track, by his dad, at the Barcelona Olympics 400m, in 1992. Well done Maria for a terrific sporting gesture ! Maria Bragin (blue) helping another athlete to the finish !